Back in 2003, the 12″ Little Al PowerBook represented one of the most convincing smash-hit model introductions in Apple history. Sharing much of the general layout, engineering, and the 12″ display of the 12″ iBook, the baby PowerBook added an aluminum housing and G4 power – plus most (but not all) of the usual slate of PowerBook features. The 12″ PowerBook has proved more reliable than average. Its Nvidia GeForce 4 420 Go and Nvidia GeForce FX Go 5200 graphics processors seem to be more robust than the ATI video cards used in the iBooks. The 12″ AlBook has the customary two stereo speakers plus a “midrange enhancing” third speaker. Its VGA video output supports dual display mode (“monitor spanning”) and video mirroring. The high-end Little Al is equipped with a SuperDrive (DVD-R/CD-RW) optical drive. The Little Al ‘Book was the smallest PowerBook ever built (110.6 cubic inches vs. 168.3 for the PowerBook 100 and 169.6 for the 2400c – only the MacBook Air has had a smaller volume), although at 4.6 lb. it was not quite as light as the original PowerBook Duo 210. It packs a powerful punch in a tiny package, with 867 MHz, 1 GHz, 1.33 GHz, and 1.5 GHz G4 processors, a 133 MHz system bus, and up to 1.25 GB of RAM. It also has the same full-size keyboard as its larger 15″ and 17″ aluminum PowerBook siblings. The 12″ PowerBook had the third-smallest footprint of any Apple notebook to date (93.74 square inches), beat only by the PowerBook 2400c (89.25) and PowerBook 100 (93.50). The small footprint and five-hour battery helped make it a favorite for airline travel. Happily, all of the four 12″ PowerBook configurations were pretty good, but the general trend was that they got better with each successive model upgrade. In my estimation the pick of the litter are the 2005 1.5 GHz models, which have the scrolling trackpad and sudden motion sensor – and are probably also the most rock-solid dependable version of the 12-incher. On the other hand, I wouldn’t really recommend the original 867 MHz unit, which did tend to run hot and had more reliability issues than the later 1 GHz, 1.33 GHz, and 1.5 GHz models. Unfortunately, Daystar’s processor upgrades for the 12″ PowerBook have been discontinued. With an upgrade to 640 MB of memory (512 MB in addition to 128 MB on the logic board), the 867 MHz model has the distinction of being the lowest-end Mac officially supported by OS X 10.5 Leopard, albeit just under the wire. 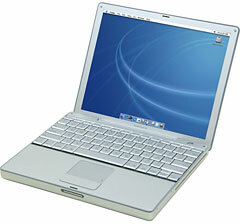 For a bit of a history refresher, the 12″ PowerBook was introduced at Macworld Expo in January 2003. It uses a 12.1″ 1024 x 768 pixel display similar to the one used the 12″ dual USB iBook (there has been some controversy over whether it is the same screen). Like its 17″ whopper big brother, it is housed in a hard anodized aluminum alloy case. Only the 867 MHz version has USB 1.1 and VGA/S-video out. Weighing a svelte 4.6 pounds, the original 12″ PowerBook G4 came with an 867 MHz G4 processor, 128 MB of double data rate (DDR) memory soldered to the motherboard (a single RAM upgrade slot allows upgrading to an official maximum of 640 MB, the same as the iBook – but OWC sells a 1 GB upgrade for just $31, bringing total system memory to 1.125 GB), an Nvidia GeForce 4 420 Go graphics processor with 32 MB of dedicated DDR VRAM, a standard slot-loading Combo (DVD-ROM/CD-RW) optical drive (a slot-loading SuperDrive was available as a build-to-order option), built-in Bluetooth, and built-in antennas and a card slot to support optional 802.11g AirPort Extreme. Its VGA video output supports dual display mode and video mirroring. In September 2003, the Little Al got a speed bump to 1 GHz with 256 MB of built-in system memory, a 512 MB L2 cache, and some other enhancements, including a Digital Video Interface (DVI) port for a pure digital connection to any of Apple’s flat panel displays, USB 2.0, and an audio line-in jack. There was official support for up to 1.25 GB of 266 MHz DDR SDRAM. Video support was upgraded with an Nvidia GeForce FX Go 5200 graphics processor (and the same 32 MB of DDR SDRAM), and support for digital and analog video out with a mini-DVI port, VGA, S-video, and composite video. The 1 GHz model includes 256 MB DDR SDRAM and a 40 GB Ultra ATA/100 hard drive. The base model came with a Combo (DVD-ROM/CD-RW) optical drive, while the high-end Little Al was equipped with a SuperDrive (DVD-R/CD-RW) optical drive. 1 GHz and faster versions have USB 2.0 and DVI video output. The 1 GHz and faster models include Nvidia GeForce FX Go 5200 graphics, which is the least powerful graphics processor to support Apple’s Core Image technology. Although it does support Core Image, it has poor performance. In April 2004, the 12″ PowerBook got another speed bump, this time to 1.33 GHz, and came standard with AirPort Extreme 54 Mbps 802.11g preinstalled, Nvidia GeForce FX Go 5200 graphics with 64 MB of VRAM, and a larger (60 GB) hard drive. The baby ‘Book continued with a 12.1″ 1024 x 768 display. Yet another 12″ PowerBook G4 revision came along in January 2005, when the Little Al got 5400 RPM hard drives, 8x SuperDrives with DVD-RW and DVD+RW support (on SuperDrive-equipped models), standard 512 MB of onboard system memory (1.5 GB maximum), a scrolling trackpad, and a Sudden Motion Sensor. The last-ever 12″ PowerBook revision – if it deserves to be called that – came in October 2005 when the DVD-burning SuperDrive was made standard – essentially a $300 price cut, although there were no other changes. The 12-inch PowerBook G4 holds the distinction of being the very last PowerBook model – and for that matter the last PowerPC ‘Book – finally being discontinued on 2006.05.16, when the MacBook was introduced. 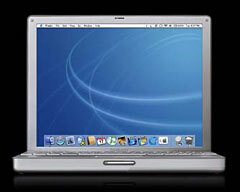 It was also the smallest Macintosh notebook produced until the MacBook Air was released in 2008. All models of the 12″ PowerBook should now be selling for well below $300. Short answer advice: Get the latest one your budget can stand. See Low End Mac’s Best 12″ PowerBook G4 Deals for current pricing. The 12″ PowerBook G4 was first introduced in January 2003 and continued in production through four distinct models until May 2006. The 12-incher’s motherboard design included double data rate (DDR) RAM, internal Bluetooth, and support for AirPort Extreme, Apple’s implementation of the 54 Mbps 802.11g wireless standard. The 12″ PowerBook is just a really nice package – small enough to be comfortable packing around but large and full-featured enough to serve quite satisfactorily as a main workhorse computer. These machines are particularly popular with photographers, presumably because they have pretty decent video support (arguably better than the Intel GMA 950/3100 “vampire video” in the MacBook), and, of course, are small enough to carry in a large camera bag. The 12″ PowerBook should prove a capable performer for several years to come yet. I was still using a 1.33 GHz G4 PowerBook (a 17″ unit) as my main production computer in 2008, although I was getting a hankering for some Intel speed, especially with Leopard. While I’ve admired the 12″ PowerBook and love it’s trim form factor, I’ve never owned one, but it’s my current pick for best value in a low-end PowerPC ‘Book. Only specifications different from the previous model are listed. a 60 GB Ultra ATA/100 hard drive.